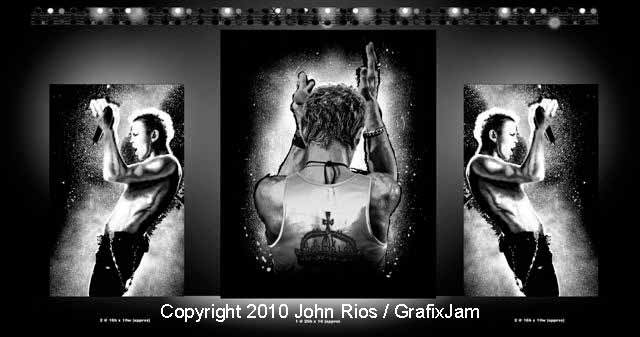 Number 5 in our continuing series on Rockin’ Clients, today I am focusing on Billy Idol. He was one of my favorite artists back in the early ’80s, and so it was really exciting to me when we worked on his 2010 tour. Billy Idol was born William Michael Albert Broad in Middlesex, England, in 1955, and spent most of his childhood in England (apart for a short time in New York when he was a young child). His early days in punk rock were spent as guitarist for several bands, including “Siouxsie and the Banshees” and “Chelsea.” In 1976 Idol, along with Tony James and John Towe, formed the band “Generation X,” with Idol serving as lead vocalist. Idol also pursued an acting career in the late ’80s and early ’90s, making several appearances onstage and in feature films. He was slated for a major role in James Cameron’s film, “Terminator 2,” but a motorcycle accident in early 1990, which caused serious damdage to Idol’s leg, prevented him from appearing in the film. Though Idol’s popularity diminished in the late 1990’s, he continued to have a loyal fan base, and appearances in films such as “The Wedding Singer” (1998) were well regarded. Idol continues to record and perform today, most recently performing in Russia, Europe, and the U.S. in 2010. His memoir, “Dancing with Myself,” is scheduled be released in late 2011 or early 2012. Whew! For those regular followers of this blog, you may have noticed that we disappeared over a week ago. Well, we’re back! What happened? Technical difficulties with our site host, related to the version of WordPress we were using. It has been a frustrating week, coordinating activities between the site host, WordPress programmers, and a host of others to get the blog up and running again. But we’re back now, ready to provide you, our loyal readers, with lots of fun and interesting posts about custom stage curtains, digital backdrops, and all manner of related information. Thanks for your patience while we were down! I’ve posted in the past about the great photos that Rent What? has posted on Flickr, but as it has been awhile, I thought I’d mention it again. We’ve told you a lot about the various custom stage curtains, theatrical backdrops, and other theatrical soft goods and supplies that are available for purchase through Sew What? and / or for rent through Rent What? But, as they say, “a picture is worth a thousand words,” and so if you are looking for inspiration for your next show or event, why not look through the many great photos in the “Concerts and Curtains” photostream on Flickr? Want to add some sparkle to your next show? Thinking about purchasing or renting an LED Stardrop. You can choose between the traditional bluish white night sky look with the Classic Stardrop, or maybe mix it up a little with color through the Chameleon Stardrop. Check out the LED Stardrops photo set for some great visuals. I mentioned before how much I love Austrian Curtains – they are so beautiful and can set so many different moods. I especially like when an Austrian seems to change color magically during a show (through the use of a variety of lighting techniques) – one moment red, the next moment blue. There are a number of gorgeous examples in the Austrian Curtains for Theatre and Stage set. Digital printing is such an amazing option today! Whereas in the past, the only way to have a large scale scenic backdrop was to commission an artist to hand-paint the image, today just about any image can be printed and sewn into almost any size scenic backdrop. From a simple 8′ x 10′ backdrop for a trade show booth to a huge 40′ h x 60′ w backdrop for a concert – digitally printing can handle it all. Check out some of our projects in the Wide Format Digital Textile Printing set. And these are just a few of the photo sets available – there is so much more. So, if you haven’t looked at the photostream lately, check it out – I think you’ll find great ideas and inspiration. You may have noticed that recently we have included more posts focusing on our sister company, Rent What? Inc. That is, in fact, intentional. We realized that, regardless of whether a customer is interested in purchasing or renting a custom stage curtain, the customer will likely have very similar questions about flame retardancy, track installation, types of stage curtains, etc. Many will also be seeking inspiration for their own projects, and what better way than to check out this blog to find out about past projects of both Sew What? and Rent What? It made sense, therefore, to “join forces” in the blogosphere, and include posts from both Sew What? and Rent What?. Rent What? is also now linking to this blog on their website, and we will continue to post on matters of interest to customers of both companies. I’ve posted recently about the various drapery collections available through Rent What?, from the “Delightfully White” collection to the “Industrial Textures.” Last (but certainly not least), I thought I’d tell you about our “Starlight LED” collection, which is great on its own or combined with drapery components from any of our other collections. LED Stardrops come with DMX compatible controllers. Low-Tech LED Drapes are 110v plug and play. Our components combine to cover the space you need. Run them horizontally or vertically, then join them seamlessly for a continuous starfield. Our stars shone for 3 Mo’ Divas….almost as brightly as they did. Our Rockin’ Red Drapery series will complete your Starlight scenes with ShowLED backdrops and LED Stardrops, while our Silver Satin Series legs and borders create a sophisticated stage. Monster Trucks recently rallied beneath our stars. Meanwhile we stole title “Star of the Show”. To bring the Southern Cross to the Northern Hemisphere.